WizKids has announced three more titles for 2018: Maiden�s Quest and Curio: The Lost Temple releasing in May and Fungeon Party coming out in June. 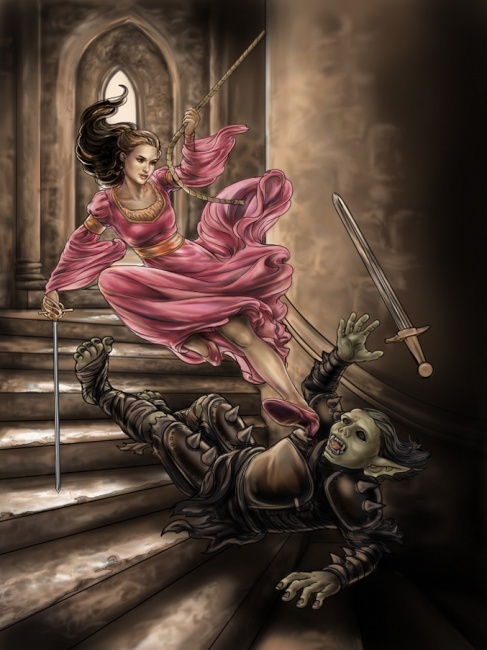 In Maiden�s Quest, the heroines aren�t waiting around to be rescued. Taking matters into their own hands, they will overcome obstacles and defeat their enemies in their quest to escape from their imprisonment. Each card can be used in four different ways to represent a variety of items, encounters, or allies to help you on your way. Thanks to the game�s encounter system, players can �pause� the game and pick up the action at the same point later on. The game is also designed to play without any playing surface, so it can be played �on the go,� when standing in line, or anywhere that players have a few minutes to face an encounter. Complete games last about half an hour. Maiden�s Quest comes with 144 cards, which is enough for solo game or two-player co-op or competitive games. Additional players can join the game by adding multiple sets together. Designed for ages 14 and up, playing time is about 30 minutes. MSRP is $19.99. Curio: The Lost Temple is a real-time cooperative game that puts players in the shoes of an archaeological team trapped in an ancient Mesopotamian complex, trying to escape before it is buried beneath the sands. In order to escape, the players must work together to solve a series of riddles and puzzles before the time runs out. 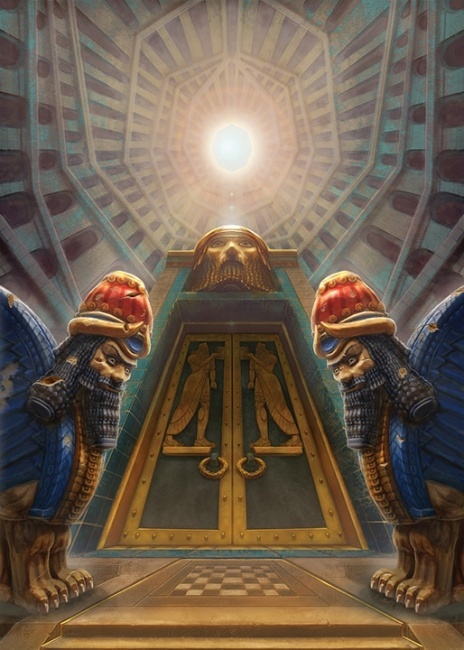 Curio: The Lost Temple is similar to other �escape room� style games, but it features a system that allows players to replay the same adventure over and over again. This game comes with 200 cards, 5 player screens, 1 Decryption Wheel, 1 booklet, boards, tokens, 2 plastic bars, and a sand timer. Curio is intended for 2 to 5 players, ages 14 and up, and plays in about 10 minutes. MSRP is $34.99. 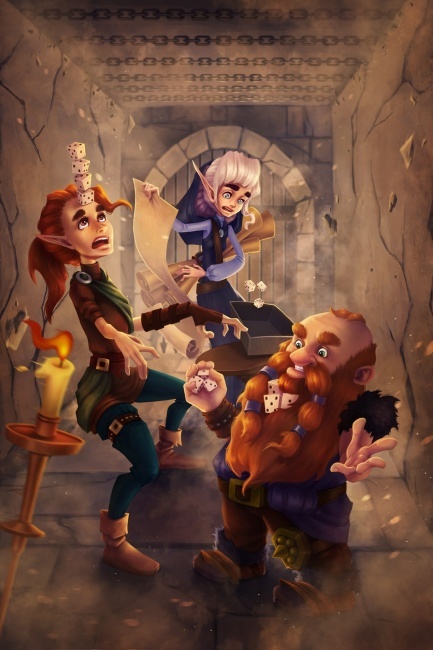 Combining �fun� and �dungeon� is the inspiration behind Fungeon Party, in which players must complete wacky dice-related stunts in order to make their way through the traditional dungeon crawl. Stunts include feats like stacking dice on the forehead, bouncing them into the box, or balancing a meeple pawn. Each feat takes about 30 seconds to complete, and players can adjust the game length by choosing the number of feats. Typical games feature six feats, allowing the game to be played in under five minutes. Fungeon Party comes with 66 challenge cards, 7 role cards, 40 dice, 1 meeple, and 6 sticks. It was designed for 2 to 5 players, ages 14 and up.